Thank you both! It definitely makes me feel better that somewhere out there there's strangers cheering me on, hah! Of course! And when you beat them I’ll know what thread to go back to to figure out what to do when it happens to me! I think I'm also experiencing dinos. 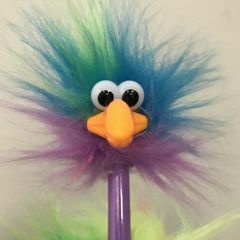 Did you purchase a one, or did you just have one laying around? Apparently, I'll be in the market for one very soon. Also, could you ID that green coral you have next to your gorgonian - the green one on it's own island? I took a look at your thread, definitely looks like the dinos in my tank but yea, you probably want a microscope. I was able to borrow one from a friend. It was a really old child's microscope kit, but worked well enough to ID! I think it really does help, at least makes me feel more confident, to know what type it is since different treatments work a lot better than others on specific species. The green coral is mint pavona! I love it. 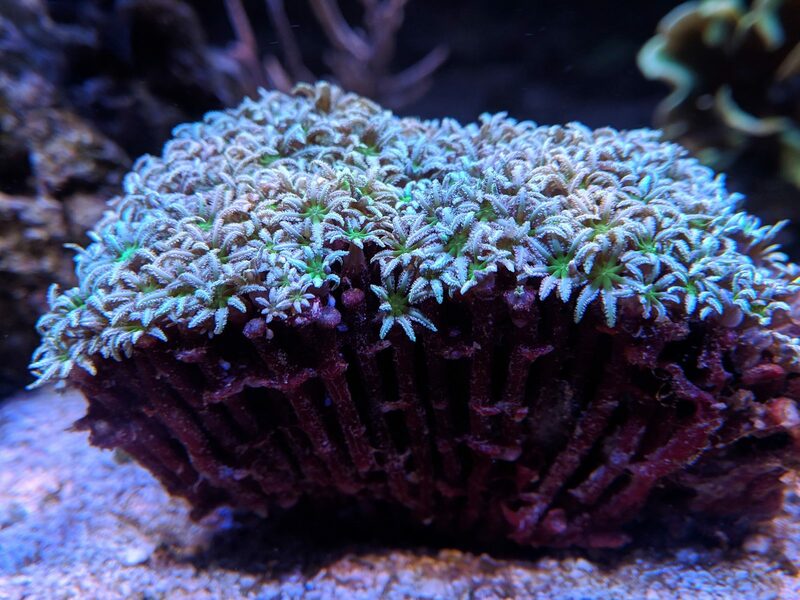 Really hardy and pretty fast growing SPS, though it is starting to bleach at the edges because it's one of the corals that's catching all the dino slime. Dinos were gone overnight after I installed the UV sterilizer! I'm going to leave it running for a week probably, as I know just because I can't see them doesn't mean they aren't just going to come right back. There's lots of algae and some other gunk growing but I'll take it over dinos choking out every single coral. I also added pods and phyto to increase biodiversity but I'm guessing the UV sterilizer is what did it overnight. Now hopefully they (and all the coraline and less desirable algae) can help keep it at bay. I'm trying to decide if I should do a water change now or wait a while longer. Also need to set up my new dosing pump. I ended up getting a bubble magus t11 like new but much cheaper from someone online, so that worked out alright. I'll share some new pics soon, but for now just had to shout my excitement from the rooftops! One possible downside is that the sterilizer is likely to also kill a lot of the phytoplankton you added, but as long as the Dinos are gone I'd say it doesn't matter much! Good to know about the phytoplankton, I didn't think about that. I've got plenty so I'll add more when I take out the sterilizer. Can you provide a link to the UV Sterilizer you used? I wanted something small and discreet myself, but if it's only in the tank for a day or two, I suppose it's size is of little importance. Sorry I've been busy the past few days. I got this one, the 18 watt https://www.amazon.com/gp/product/B0034VDEPA/ref=ppx_yo_dt_b_asin_title_o00_s00?ie=UTF8&psc=1 It's ugly and I had to get big ugly tubing to go with it, but I plan for it to be very temporary and it gets the job done! Came over here from @billygoat's comment on my thread about the dinos- and i'm glad he did. I'm in love with this tank!! and your possum wrasse. I really want one of my own now. SO CUTE!! My kitties are also obsessed with my tank. I'm pretty sure the lawnmower blenny enjoys teasing my girl kitty. Will be interesting to hear about your experience with the UV sterilizer! fingers crossed it works like a charm. dinos are the worst. That's unbelievable that the dinos went away right after installing the UV sterilizer! Are they still at bay? I think so. I haven't seen anything stringy like before, there's some brown on the sand but it's possible that's just diatoms as there's also a lot of pods, algae, and cyano now. I need to get the brown bits left under the microscope! I took down the sterilizer today since nothing's come back for a few days and it's starting to get in the way, let lots of snails escape, etc. I'm pretty curious to see what will happen! I realized this week my tank has reached its one year birthday! 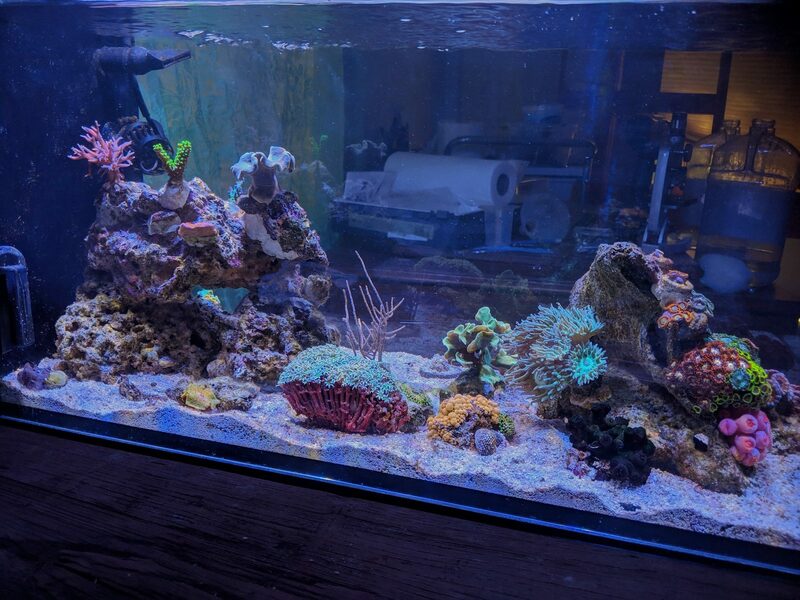 I don't know if it counts since I changed tanks, and it certainly doesn't feel like a year old tank with the issues I'm dealing with, but as a newcomer to reefing, I'm pretty happy with how much I've learned and built in a year. Overall the tank still looks like poo. After I took the UV off, brown stuff started to grow back on the sand, and a little on the rock, but not at all to the extent of before, and it doesn't seem to be very stringy like the past dinoflagellates. I got a new sample under the microscope and it seems like there are definitely still dinos in there, but not as many, and there's also a new, much smaller, little critter in there. I'm hoping that this might actually be ciliates that prey on dinos. So I don't want to put the sterilizer back on as it would kill the ciliates as well, and I'm hoping they will naturally balance things out. 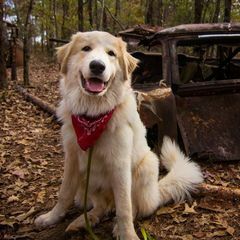 Here's some vids if anyone wants to check them out. Kinda wishing I had a better microscope at this point, but it'll do. So hopefully that's on the way out but I also have tons of green hair algae and some cyano and probably diatoms that are growing as well. It started before I even put the UV sterilizer on, but now has gotten out of control. My nitrate has been .3 - .5 and phosphate at 0 for the past three weeks, so I guess it's one of those "the algae is consuming nutrients before they can be read" situations? I'm kinda at a loss on how to combat the algae and dinos at the same time, since different things are recommended for them. I've been feeding a little heavier and waiting longer between water changes because I thought my low nutrients were helping the dinos flourish, but that might have just greatly encouraged these other nuisances. For now I'm just going back to a normal routine. Going for manual removal of the algae but this type isn't coming off with tweezers as easily as I remember before. It just kinda smooshes around and won't come off in a clump. Toothbrush works but then I have to try to get all the algae floating all over the tank out. Thankfully most of the corals have been doing well regardless, and I even got a few new pieces! I was so annoyed at myself for it, but I bought a black sun coral and red goni right before the dinos really exploded and I realized I had a problem on my hands, but they made it through. When things were looking better I saw the exact pipe organ I have been looking for for a year in the Diver's Den, so I HAD to get it. Y'all, I totally understand the people that say buying corals is an addiction and I'm officially an addict. 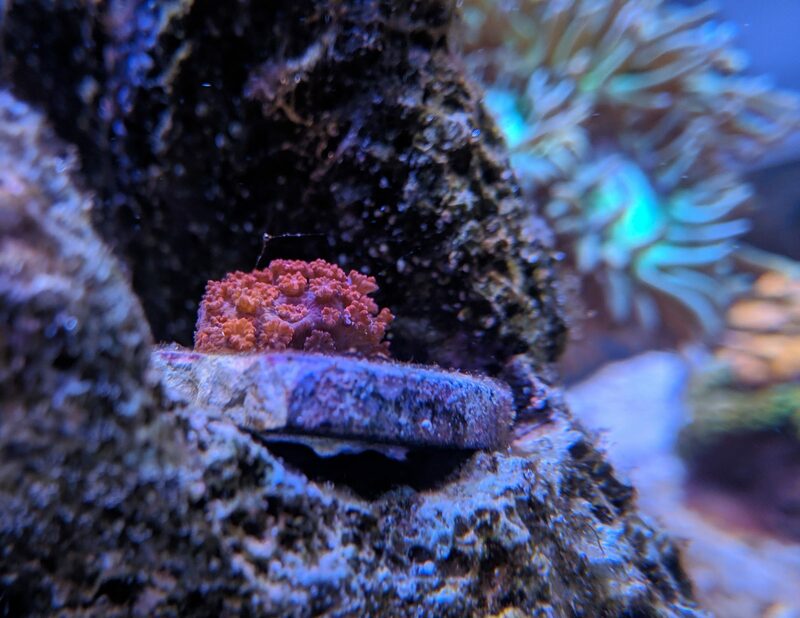 I had trouble deciding which goniopora to get, then when that pipe organ showed up it seemed idiotic not to get a second coral to get free shipping, so I got a purple and green goniopora as well so I could decide which I liked better. I don't have many photos I'm proud of with the tank looking the way it is but I still want to show off my new coral! The pipe organ is HUGE, I'll definitely have to frag it. 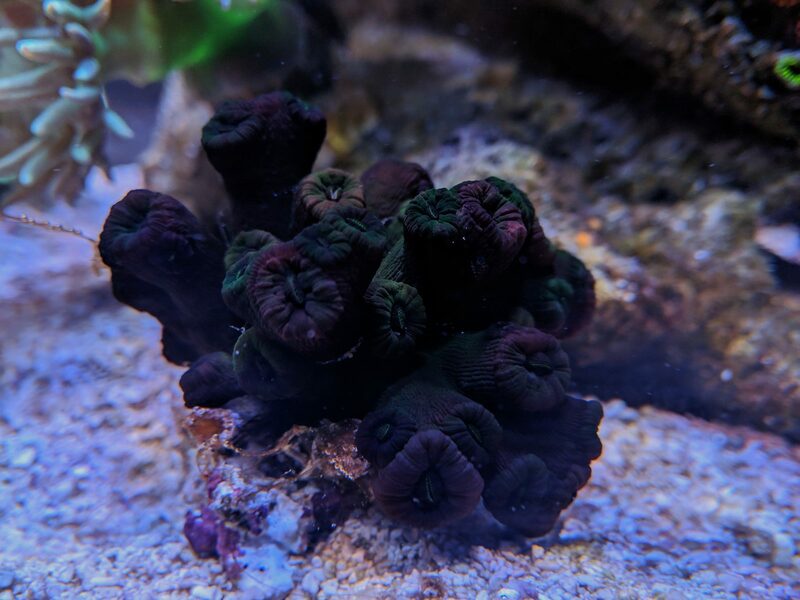 Here's the black sun coral to go with my pink one. 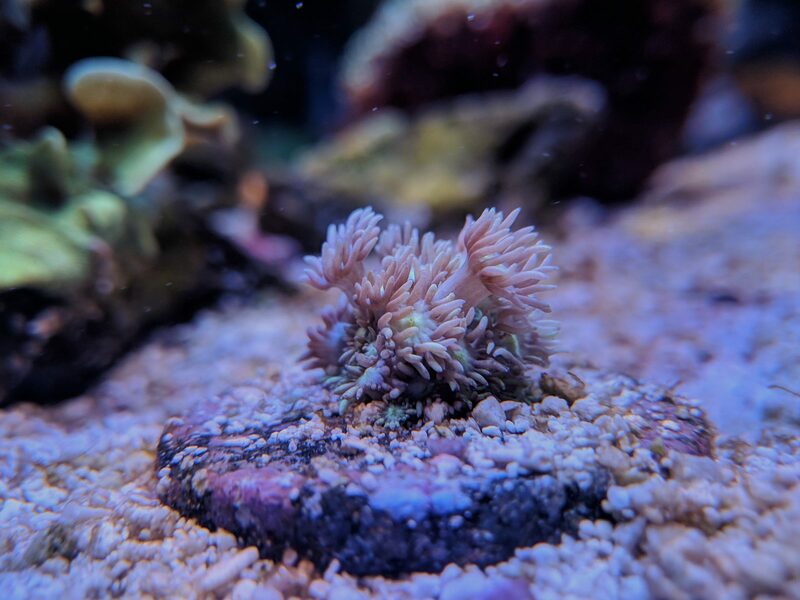 It's polyps don't extend as eagerly as the pink, but after the first couple days of training it still opens up every evening to eat! Pictures don't really do it justice. 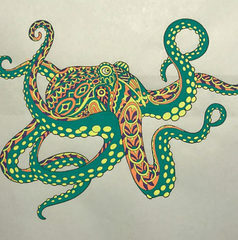 It's a beautiful, dark, velvety green, with hints of black and brown, while the polyps and tentacles are more of a brown/black color. 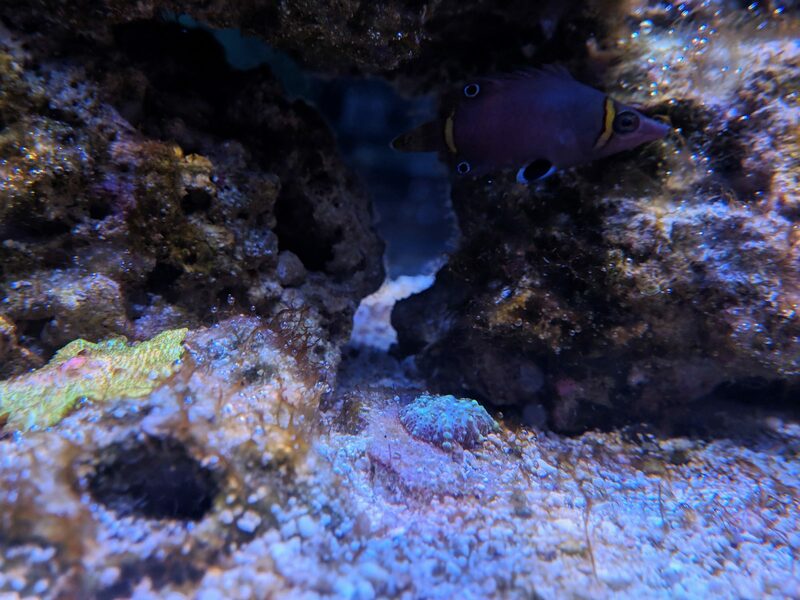 The red goni is hard to photograph where it's located, but it seems to be doing well enough. 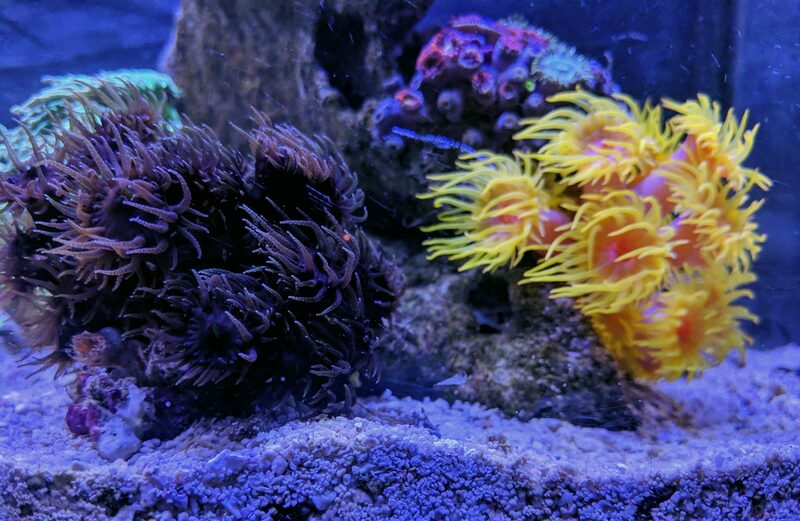 I really wanted that long polyp look from these, and they haven't extended that far yet, but they have been open and healthy looking so hopefully we'll get there. The room is a mess from all the work I've been doing in here, I need to mount corals, and like I said, it's not in the best state, but I figured I would throw in a quick FTS as well. Since all the issues right now seem like new tank syndrome stuff, I'm just hoping I can continue to stay on top of the routine, make small changes if necessary, and things will naturally start to mellow out. 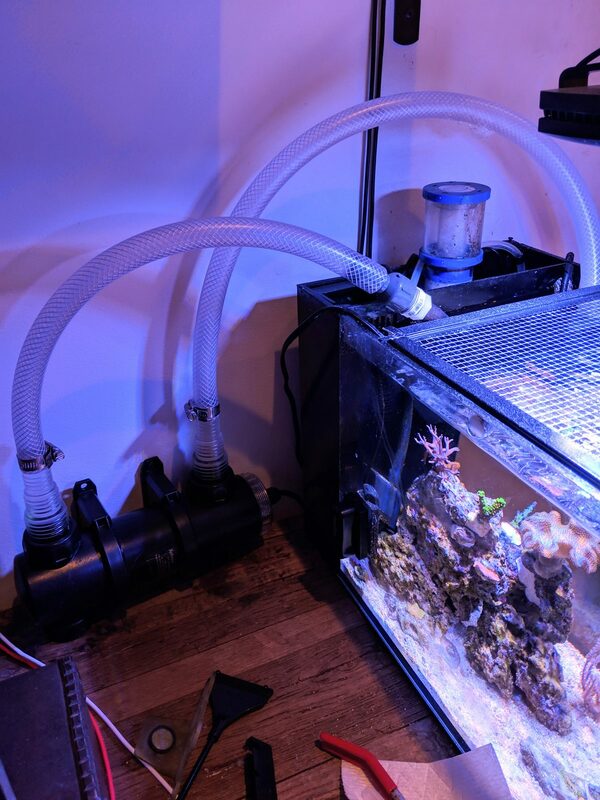 I also moved the tank over to a stand instead of having it on the desk, so I finally have somewhere to organize all my cords and containers and such and will FINALLY set up my dosing pump. Alkalinity, calcium, and magnesium have definitely gotten out of wack with me trying to dose manually, so I'm sure the corals will really appreciate some steady parameters. I'm sure everything will be fine, but I'm really missing having a pristine, colorful tank right now. So congratulations on your anniversary! That's definitely a really big milestone. Your pictures look gorgeous, and the FTS is very beautiful. I love the contrasting light and dark colors on that enormous pipe organ coral! And I also like how much open space there is in your display. Some reefers like to fill the whole thing up, and that's certainly a strategy that can be very lovely as well, but I personally like the way large areas of negative space set off the rocks and corals. Congratulations one 1 year! I think the tank looks great despite the issues. We all deal with them and it’s just part of the hobby. Love the sun corals! Maybe I’ll be brave enough to get one of those I the future. Congrats on 1 year. I think the tank looks great! Continued good luck with those damn dinos!